As ancient literature and a cornerstone of the Christian faith, the New Testament has exerted a powerful religious and cultural impact. But how much do we really know about its origins? Who were the people who actually wrote the sacred texts that became part of the Christian Bible? 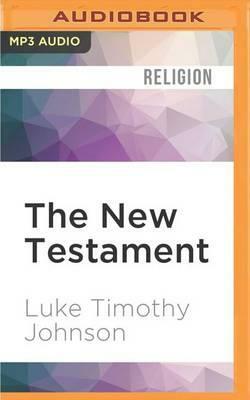 The New Testament: A Very Short Introduction authoritatively addresses these questions, offering a fresh perspective on the underpinnings of this profoundly influential collection of writings. In this concise, engaging book, noted New Testament scholar Luke Timothy Johnson takes readers on a journey back to the time of the early Roman Empire, when the New Testament was written in ordinary Greek (koine) by the first Christians. The author explains how the Gospels, Acts of the Apostles, and Revelation evolved into the canon of sacred writings for the Christian religion, and how they reflect a reinterpretation of the symbolic world and societal forces of first-century Greco-Roman and Jewish life. Equally important, readers will find both a positive and critical reading of the New Testament--one that looks beyond its theological orientation to reveal an often-surprising diversity of viewpoints. This one-of-a-kind introduction engages four distinct dimensions of the earliest Christian writings--anthropological, historical, religious, and literary--to provide readers with a broad conceptual and factual framework. In addition, the book takes an in-depth look at compositions that have proven to be particularly relevant over the centuries, including Paul's letters to the Corinthians and Romans and the Gospels of John, Mark, Matthew, and Luke. Ideal for general readers and students alike, this fascinating resource characterizes the writing of the New Testament not as an unknowable abstraction or the product of divine intervention, but as an act of human creativity by people whose real experiences, convictions, and narratives shaped modern Christianity.